Renowned typographer and poet Robert Bringhurst brings clarity to the art of typography with this masterful style guide. Combining the practical, theoretical, and historical, this edition is completely updated, with a thorough revision and updating of the longest chapter, -Prowling the Specimen Books, - and many other small but important updates based on things that are continually changing in the field. 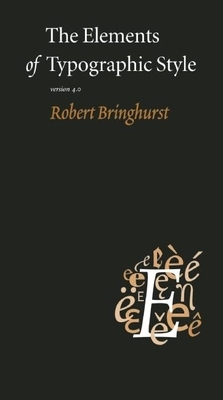 Robert Bringhurst is a poet, typographer, linguist, critic, designer, translator, teacher, and cultural historian. He has published more than thirty books, eighteen of them books of poetry. His book, The Black Canoe, a study of Bill Reid's sculpture, is a classic of Native American art history and his book The Elements of Typographic Style is considered the "bible" for typographers the world over. In Canada, Bringhurst is best known for his groundbreaking study of Native Canadian oral literature, A Story As Sharp as a Knife: The Classical Haida Mythtellers and Their World (1999), a work that startled many readers and sparked intense academic and public debate. Two volumes of translation from classical Haida complete the trilogy: Nine Visits to the Mythworld and Being In Being. In 2004, the trilogy earned Bringhurst the Edward Sapir Prize, awarded by the Society for Linguistic Anthropology. Among his more recent books of poetry is Ursa Major (2003), a multilingual work in which characters tell simultaneous stories in English, Latin, Greek, and Cree. Born in Los Angeles in 1946, Robert Bringhurst was brought to Canada at the age of five, raised largely in Alberta, and has lived and worked in British Columbia since 1973. He currently lives near Heriot Bay on Quadra Island.